Forecast: Kodiak West, away since last summer but training well enough to be fit and ready, moves up a notch following a sharp score in her most recent outing and seems capable of winning again from this tougher group. She has tactical speed and a nice late kick, and with good racing luck the Drysdale-trained Irish-bred filly should be along in time. Tell Me More is genuine and consistent and a solid fit on speed figures. In the money in all six of her starts over the local lawn, the Miller-trained mare moves up a level and picks up 5 lbs. off her New Year’s Eve score but with another forward move she’ll be right there. We’ll prefer Kodiak Kid on top but include both in our rolling exotic play. Forecast: Sneaking Out seeks her third straight score and appears well-placed to continue her upward mobility. She has the ideal pace-stalking style for this extended sprint distance and returns from the Bay Area for the big money run. Lippy, runner-up in the Cal Cup Oaks two-turning on grass, can be equally effective sprinting on the dirt and continues to impress in the a.m. for O’Neill. She’s not as fast on pure numbers as Sneaking Out, but certainly has plenty of room for improvement. We’ll use both in our rolling exotics and then have extra tickets keying Sneaking Out on top. Forecast: ​Bellafina is 2/5 on the morning line and certainly should win, but Flor de La Mar offers a chance at a price and is worth tossing in on a ticket or two. Bellafina is perfect (3-for-3) over the Santa Anita main track and clearly is the controlling speed, while Flor de La Mar is stretching out to a distance she should love and hasn’t shown anywhere near her best so far in just two career starts. Forecast: Here’s a messy starter’s allowance sprint requiring a spread. We’ll use three and hope that’s enough. Swiss Minister offers price value at 8-1 on the morning line and may be as good as any. The veteran gelding makes his second start off a layoff and returns to a main track he’s always loves (six career wins), so we’re expecting the Vallejo-trained son of Lucky Pulpit to fire his best shot. Littlebitamedal earned a career top speed figure when third in a hot $32,000 claimer recently and a repeat of that effort today puts him in the hunt. Captivate, third in his seasonal bow in a similar spot, has a right to step forward for Puype and is reunited with “win rider” Van Dyke. He’ll be doing his best work late. Forecast: Vasilika is 3/5 on the morning line and looks it. A winner of 15 of 30 career starts that includes a record of 9 for 10 over the Santa Anita turf course, the veteran daughter of Skipshot lands the good rail and should draft into an ideal second flight, ground-saving trip and then produce a winning kick when ready. She’s a logical no value rolling exotic single. Forecast: ​This highly-competitive edition of the Echo Eddie Stakes for 3-year-olds has several possibilities, so we’ll go four-deep in our rolling exotics but otherwise pass the race. Lieutenant Dan returned to winning form with a sharp score up north and appears to have the perfect style for this extended sprint trip. The career top speed figure he earned when breaking his maiden over this track in January makes him the one to beat. Listing won a Cal-bred sprint stakes on turf recently but can be just as effective on dirt, so with Rosario taking the call the son of Square Eddie is a logical contender. Foster Boi didn’t have a whole lot behind him when graduating at first asking on grass but did so like a nice prospect and has trained well enough on dirt to suggest the surface switch won’t be an issue. Prat will have him rolling late. Tap the Wire, unbeaten in a pair of juvenile races including the Graduation Stakes at Del Mar last August, returns for Dunham with a strong work tab from San Luis Rey Downs and could easily be this good in his seasonal debut. Forecast: One Bad Boy was no match for Omaha Beach when a distant second in a highly-rated extended sloppy track sprint in early February but earned a sharp speed figure even in defeat and should be set to stretch out and graduate today for Baltas. He’s bred for turf and likely will find himself within striking range throughout, ready to pounce when called upon. Time is Now had a promising sprint prep in his debut and seems likely to produce a forward move while stretching out and switching to grass. Mandella has solid stats with both angles. Proud Pedro makes his U.S. debut with Prat taking the call, so we’ll assume he’s a live item. The work tab isn’t fancy but steady enough to have him ready. Let’s use all three in our rolling exotics and then press a bit keying One Bad Boy on top. Forecast: Baffert holds the aces with the two main contenders in the Santa Anita Derby, either of whom can win. Game Winner has the more impressive credentials, but Roadster was highly impressive in his comeback win and certainly could be this good. We’ll double the race in our rolling exotics but otherwise sit it out. Forecast: The Providencia Stakes for 3-year-old fillies over nine furlongs on grass is a contentious event with a few price possibilities. Truffalino is progressing with experience and should love today’s longer trip. The daughter of English Channel looks dangerous from off the pace and is better than her morning line of 10-1 suggests. Apache Princess was brought back too quickly in the Cal Cup Oaks (eight days) and paid the price with a flat performance, finishing fifth as the 6/5 favorite. Freshened and showing her old spark in a.m. drills for the Desormeaux brothers, the daughter of Unusual Heat may be a tad suspect at this distance but offers good wagering value at 6-1 on the morning line. Colonial Creed has rising speed figures and good tactical speed; in fact, she might find herself on the front end. This mile and one-eighth distance could be stretching her limit, but if left alone up front she may very well get brave and never look back. 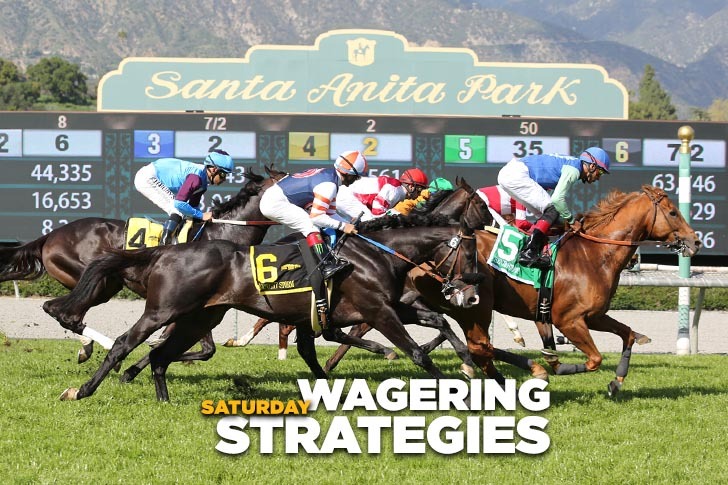 Forecast: Similar to the Santa Anita Derby, this major Grade-1 event offers no wagering value, so we’ll include both Gift Box and McKinzie in our rolling exotics but otherwise sit the race out. Gift Box fires his best shot fresh and should enjoy a perfect pace-stalking trip, while McKinzie is fastest in the speed figure department and will be a short price again after missing at 50 cents on the dollar in the San Pasqual Stakes earlier this meeting. Both have trained like they’re ready for a top performance and are hard to separate. Forecast: The Hunted returns to his preferred distance – a flat mile – and should return to winning form in this better-than-par entry-level allowance turf affair. The Baltas-trained gelding lands an ideal post and projects to settle into a comfortable second flight position and have every chance from the quarter pole home. At 3-1 on the morning line he’s a strong straight play and rolling exotic single.